Eye of the Storm is a quartet who hail from the metro NYC area and whose metallic leanings fall somewhere between the powerful crunch of the NYC scene, circa the mid 1990s, to the wallop of bands whose metal influence are a little left of center, like Tool, Rush, and especially early Soundgarden. The thirteen tracks on "Fall Into Grace" showcase a band whose stellar musicianship and dark atmosphere combine for a potent blend of heavy rock with an aura of eeriness that is hard to shake and even harder to ignore. Tracks like the brooding title track or the tribal "Masquerade" sound like a cross between the spirit of Fates Warning with the soul of Alice In Chains, making Eye of the Storm a treat for a metal fan who take their metal seriously. 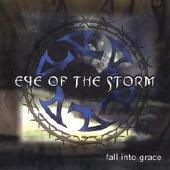 For more information, check out http://www.eyeofthestorm.com.